The first beach polo event in Thailand took place on April 11th in a two chukker exhibition match between the Thai Polo team and the distinguished team of Royal Pahang of Malaysia in a fund raising effort for the Princess Mother’s Charities. With all of the pomp of England’s Cartier Day, a marching band of Thai children from Hua Hin led the parade of 60 horses through the center of the quaint little town and directly onto the beachfront of the Intercontinental Hua Hin resort to take part in the opening ceremony. Activities began with a horseback fashion show that included many Thai celebrities, socialites and children among the guests, showing off Burberry, La Martina as well as La Perla beachwear. A 300 meter fundraising horse race took place on the beach, following the horseback fashion show, with ten horses competing for the winning spot before the polo games got underway. As a prelude to the feature match, a children’s game took place. 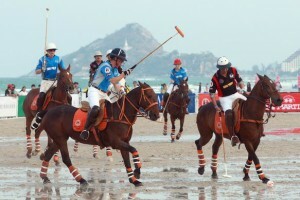 The fast-paced and exciting competition featured a young Thai Polo team and a Beach polo team. During the main event, Mr. Harald Link’s Thai Polo team found itself on the short end of a 5-4 score, with Royal Pahang, cheered on by Prince Abdullah, raising the cup at the end of the game. With the onset of the evening, the Bangkok Symphony entertained the guests, who danced to the music in the waning light of the day that was capped by a delightful barbeque dinner in the well appointed gardens of the Intercontinental Hua Hin Resort. I am not sure what you would propose of me as I reside in Palm Beach, Florida. If you have any specific suggestions, I would be happy to try to assist your friend. reading this webpage’s post to be updated daily. I jut like tthe helpful info you provide oon your articles. sure I willl learn plenty of new stuff right here! Good luck ffor the next!